Last month, President Obama signed the bill for Microbead-Free Waters Act of 2015. This Act will ban all microbeads product in the US starting from year 2017. The microbeads that commonly found in our beauty products (such as scrub, exfoliator, toothpaste, etc.) are flushed down into the ocean/river because the straining system in our sewage are not sufficient to break down the microbeads particles. The straining system can only dissolve organic susbstances and the microbeads made out of plastic will be washed down into our ocean/river. The fishes and other sea animals will then consume the microbeads thinking it is food. 2017 is a long way to go. From now till then, there will be zillions of microbeads beign flushed into the ocean, if we do not take any action. So, it is our duty as a beauty consumer to stop using products with microbeads at once! What you can do is take notice of the ingredient list on the product. You will be surprised by the brands that claimed their corporate identity as "environmental friendly" or "natural", still using microbeads as part of their ingredients. See the product list below. My late friend, Wingz, used to educate me on the stuff we washed down into the drain. He was a true environmentalist, hence his business BYOB that produce cleansing product out of natural substance or minimal chemical. In our quest to keep ourselves beautiful, we should first keep our mother earth beautiful. If you do a bit more of a research, there are plenty of effective beauty products made from natural ingredients. Instead of spending money on scrubs and hurt the environment, you can save money and save the earth with some simple recipe. Let me know if you would like me to do a DIY tutorial for scrubs. I don't want to stop using scrubs! 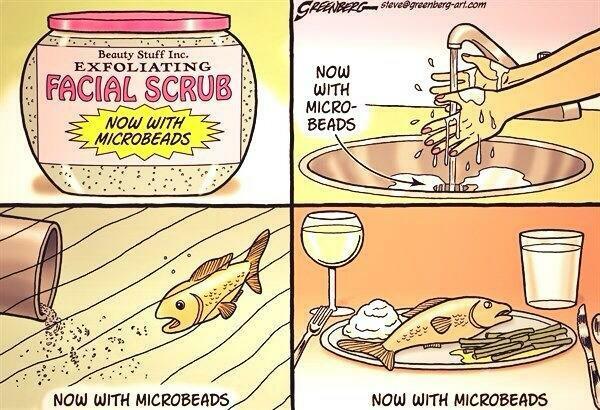 But yup, I'll stop using micro beads. I was aware of the micro beads a month ago when US banned it and gladly, I stop using Biore face wash before it was ban. Now I'm more aware of any health brand consist of it. Thanks for the post and the ingredient warning is very useful for me. Great post xo.